I've been raising a small flock of backyard chickens for over fours years. We joined the trend for the eggs and fertilizer and discovered that we enjoyed watching them scratch around the yard. My first flock--three hens--didn't like to be handled, but they did run to me when I went into the backyard and yelled, "Hey girls." If you've ever watched a hen run, they're cartoonish. The first of the flock met her fate last spring in the jaws of a predator--presumably the fox that had been casing the backyard. The second just up and died one morning this summer. This left us with the third, who, by now, was no longer laying eggs. I struggled with the idea that I was buying organic feed and cleaning the coop for a chicken who wasn't contributing. I was especially not very interested in doing this through a Vermont winter. Which all naturally leads to the question of a hen "harvest". I had a difficult time coming to terms with the idea that we could eat our hen. But while reading Barbara Kingsolver's Animal, Vegetable, Miracle this summer (from which I borrow the term "harvest"), I concluded that I had raised my bird in the natural, organic, and local manner in which I want my food raised, and I eat chicken, so "souping" her seemed to be the holistic will of the world. Side bar#1: I read the book's chapter on harvesting hens on Labor Day weekend. Coincidentally, that chapter begins with this: "The Saturday of Labor Day weekend dawned with a sweet, translucent bite, like a Golden Delicious apple." So the decision to harvest was really tipped by this connection that I was fortuitously reading about Labor Day weekend on Labor Day weekend. I saw it as a sign. Side bar #2: On this same Saturday, I brought home my second flock--five hens and a rooster. When I put them in the coop, the old hen attacked them. I saw the feathers sticking out of her mouth as a second sign. So Husband calls Uncle Hugh, a long-time Vermont farmer and hunter, sharpens his axe, and starts boiling water. Husband is not a long-time Vermont farmer and hunter, so I'm curious to see how this activity will all pan out for him. In the meantime, I leave the house for 10 minutes on an errand. When I return, Husband meets me in the driveway and tells me that Uncle Hugh has already come and gone. "What? You couldn't have done all that in 10 minutes?" "Well, Uncle Hugh picked her up and decided she was too scrawny and not worth the effort." "Where is she?" I asked. "Buried in a hole out back." I asked no questions about how she got in the hole, but I suspect my holistic plan of raising and honoring my food was essentially cut off at the neck. So my new flock has grown into four hens and two roosters. 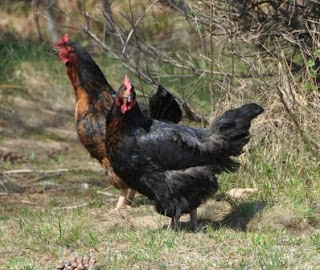 Any backyard poultry hobbiest worth a dozen eggs knows that two roosters will lead to problems. My hen supplier had agreed to exchange the rooster if I decided I didn't want him, but when I went to return him, the guy just gave me another hen and convinced Husband to give the harvest another shot with rooster #2. "He'll give you a good four to five pounds of organic meat," he assured us. (Given the price of the local, organic chicken I bought the other day at the market, this bird will save us almost $50.) This is still on the ToDo list.